Please add your comments to this site. If you are a Loughton and want to contact other Loughtons who may be passing by please feel free to do so. Norman (Richard) Pitchford was my grandfather. 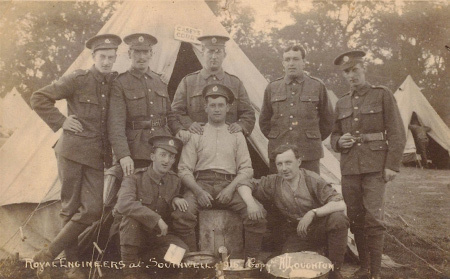 A lovely site, I found it while researching my family who lived in Southwell. The Castle family lived in Southwell and Frederick William Castle had a furniture shop, one of his daughters, Lucy married Richard Pitchford. There's lots of lovely pictures, very interesting. Son of John Trantum Loughton, grandson of Ronald Smeaton Loughton, great grandson of Charles Loughton (I know we are from Western Australia as far back as Charles)....I'm poking around just starting (today) to research the family. Great site, look forward to any feed back from Loughton's. Bruce John Loughton, Maryland U.S.A.
David Loughton, Cape Town, South Africa. My Grandmother was Elizabeth Wakefield Marshall, Alfred J Loughton's sister. My mother being Mary Elizabeth Baddeley Nee Marshall… I have a lovely sepia picture of Alfred Loughton working on one his violins if anyone would like a copy I will be pleased to send one. Also I have a few original play bills framed on my wall. I also have a large collection of photgraphs of the interior of Southwell Minister. A couple of years ago I met a resident from Southwell and passed on quite a large collection of photos and plans of Southwell Minster which hopefully found their way back to the Minster as I am resident in the Channel Islands. As you are probably related to me hence your knowledge of Uncle Alfred I would love to contact you. I would very much like to try and find my mothers father, maybe you can help? My grandfather Alfred Loughton was an imegrant from Egland but dont rember where. I do have it at home in the book he wrote of his life for our family. Interesting site, thank you! James Kevin Loughton, Merced, California, USA. A real treasure trove for someone like me who was Southwell born and bred! Was particularly interested in the origin of The Ropewalk. Great site. Heather Brown, Newark, Notts, UK. I enjoyed seeing the images and imagining where my 17c ancestors hailed even though I know the town well. Alison Wright, Mansfield, Notts, UK. Thank you for the wonderful information, as it gives me the personality behind the camera. He had a very good eye. My postcards have a bit more to them now. I would like to know if you or anyone knows about the name "Wakefield" for over a hundred and fifty years every Marshall in my family has had the middle name of Wakefield. I found it strange to see a Wakefield Marshall on this site. Feel free to email me about the name if you know anything about it. Great site, I lived in the Southwell area until 1992 and the pictures brought back many fond memories. Keep up the good work. Kevin McDonald, Carlow, co Carlow, Ireland. Bernard Newman, Heaton Moor, Stockport, Cheshire, England. My family are from Derbyshire. I wonder if there is any connection? Have no idea about my family tree though, except grandfather is called Kenneth Loughton and worked in areas around Ashover, Clay Cross etc. Andrew Loughton, Leeds, West Yorkshire, England. Fascinating! I hope I'm related to the Mr. Lassells who did the Hornpipe at the Southwell Theatre in 1812!!! Any relation to William Lassell of the Liverpool brewery and astronomical discoveries? Michael Lassell, New York, New York, USA. My mother was Mary Elizabeth Marshall and I vaguely remember meeting Uncle Alfred. There was a bottomless well in his back garden covered by a stone. I wonder if any one ever found it!. Margaret Elizabeth Main, Alderney,.Channel Islands. Any known connection with my LOUGHTONs whom I have documented back to the mid 1700s in southern Cambridgeshire, especially Dry Drayton? I was born near Wisbech, Cambs in 1931 and came to Canada in 1967. The gap of 3000 miles between me and the CRO in Cambridge makes it very difficult for me to do a lot of necessary record checking. Very nice I liked looking at your site thanks. Most interesting and enjoyable your website is like reading a good book that i cannot put down. There should be more thoughtful, wellpresented web sites on bygones such as this one.As a Canadian researching the Woulds, Drayton and Bridges families pre 1855 nr.Sturton le Steeple,it has been VERY informative. I love local history and have enjoyed your tour of Southwell More please. HI!! I FOUND YOU BY ACCIDENT,VERY INTERESTING,IV BEEN LOOKING FOR DAYS,FOR THE TRIP TO JERUSALEM,GOOD ON YA! !JOAN TOOGOOD ---NEE LANG,FROM NOTTM ORIGINELY,BYE. The only known Loughtons in Australia that I am awhere of are my grandad's siblings and their kids. Alfred was my great great uncle. Congratulations on the site. I found this most interesting. Keep up the good work. Good use of the medium. 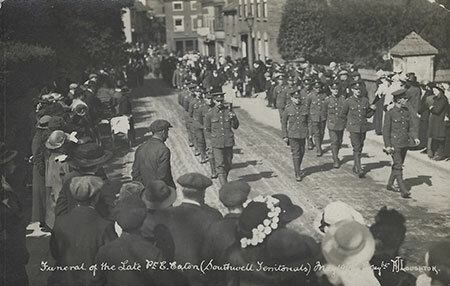 Usually such photographs are only available locally, but with so many people who have passed through Southwell at some time in their lives being scattered far and wide it is very gratifying to find access to such images being made possible. Thank you. I am looking for a photo of Prospect House in Nottingham which is no longer there - any help greatfully received. I was born in Nottingham, and really enjoy reading your pages. They bring back very many memories, so please keep up the good work !! I lived for a year in Nottingham and I miss it very much and this web site gives ne a little piece of the place that I came to love. Keep up the good work! I have family in Nottingham an was very curius to brows you site? It was GREAT! I am the family genealogist here in Canada and would be intersested in any "Heath & Shaw" family connections you might have for me. Superb Web page..told me some things i didn't know! A great site,was born in nottingham and so were my children. Brought back many memories of when I lived in Nottingham. A great page, keep up the good work. I love to see pictures and history notes from Notts. especially Widmerpool and Kinoulton areas. Do you by chance, have pictures of Kinoulton church or even the name of the church itself? Looked at this web site as interested where relatives came from. I seem to have had relatives in the Balderton area, at least they were on the 1881 census for Nottinghamshire. I hope I can someday find some marvelous old photos of my English ancestors. Linda Whittaker Knott, Colchester, New London, Connecticut, U.S.A.
Amusing to read and keep in touch with. As a former Nottingham lad (Bulwell, Whitemoor & Mapperley) I'm fortunate enough to visit the world of my youth annually and appreciate any local reading - keep up the site. John Blacknell, Fayetteville, Georgia, U.S.A.
As a Nottingham lad I sometimes have a quick look at the local evening paper when checking my Email. Found your site linked with the Nottingham Evening Post and eventually stayed on the net much longer than expected. Very nice - I will look in again. Regards Vic. A fascinating site - my grandmother's name was Dorothy Emily Loughton born in London in 1892 - hence my interest in the surname. Nice to see a little of 'ome and area. Went to Brackenhurst in early '70's and enjoyed pleasant memories of Southwell. When we come over we usually drive through town and see the minster. Your site has brought back happy memories. I was born at Southwell in 1925. I left Oxton in 1968 to come to Western Australia. I think Blairs newsagents shop was on the site of 4 Market Place. I know a lot of rebuilding took place. Regards. Best family history web site that I have seen so far. Any relationship to the Loughtons who originated near Cambridge, Eng. (Waterbeach, Dry Drayton, Shingay) mid 1800s?? Please note that this comments page is created by hand and not automatically by a cgi script, you may have to wait a few days for your comments to appear. Sorry for any inconvenience that this may cause. Thank you to all the people who have contributed to this page.